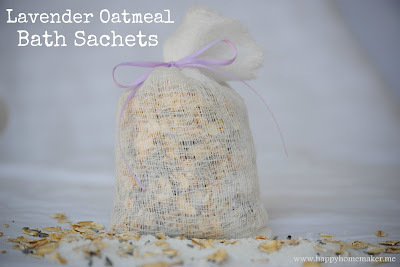 I think my very favorite home remedy is this lavender oatmeal bath sachet. The combination of lavender and oatmeal is so relaxing that I feel ready to fall asleep right there in the bathtub. 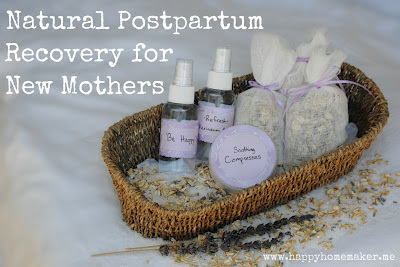 While this is a wonderful treat for anyone, it is especially soothing for new mothers. I can't think of anything more lovely than to unwind in a lavender, oatmeal, and Epsom salt bath. 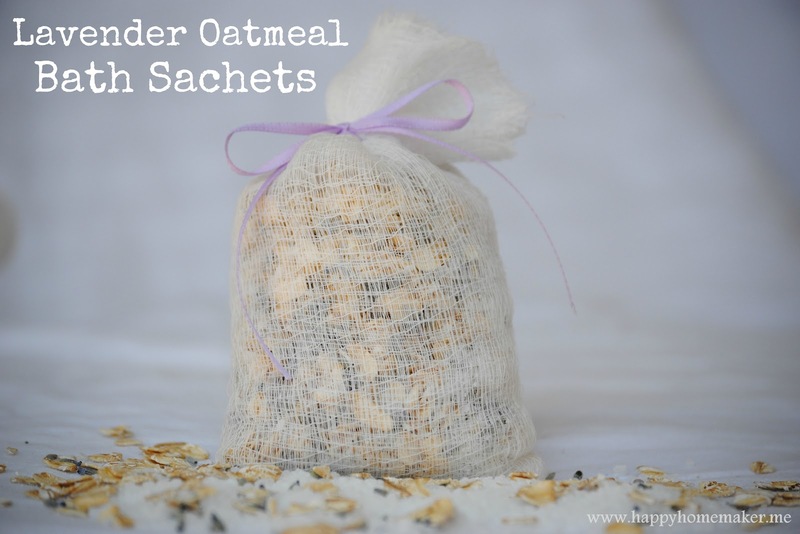 As I mentioned yesterday, lavender is a natural antiseptic, and oatmeal is a wonderful way to relieve itching and bring healing.. As this sachet steeps, the lavender infuses the water with healing oils to kill bacteria, help skin regain elasticity, and bring a sense of calm. Simultaneously, the oatmeal is working into a silky cream that coats the skin to soften, soothe, and heal. Epsom salt is known to reduce stress, inflammation, and relax sore muscles. It also makes the water feel "soft"--I don't know how else to explain it. The combination of Epsom salt and oatmeal leave the water feeling purely luxurious. You could easily just pour all of these ingredients into the bathtub, but creating a sachet out of cheesecloth will keep you from cleaning out the tub of little bits and pieces when your bath is finished. I highly recommend this simple little project. Start out with two 4.5"x13" rectangles of cheesecloth. You will want your sachet to be double-thick because it is so thin and gauzy that pieces will get through unless it's double or triple thick. 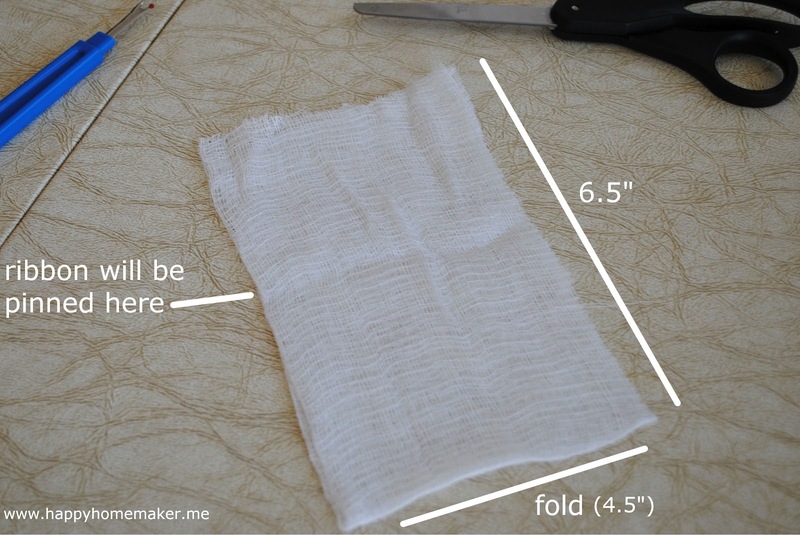 The easiest way to do this is fold the cheesecloth so that you have a length of 6.5", and then cut it into 4.5" strips. The fold at the bottom gives you one less side to sew. Next, take a 10" length of satin ribbon (I used 1/8"), fold it in half, and pin it to the inside of your folded cheesecloth strip, about 1-2 inches from the top. Make sure all of the edges are matching (you don't really need to pin cheesecloth since it sticks to itself) and sew a strip down each side. Now comes the fun part--filling your sachet! Mix the lavender, oatmeal, and Epsom salt in a bowl and use a funnel to pour it neatly into your little bag. Tie a dainty bow with the ribbon, and you have yourself a lovely sachet! These wonderful little sachets leave you feeling pampered and refreshed, which is exactly what every new mother needs. Add a few sachets to your natural postpartum recovery set, and you'll have one pampered momma. Would it be okay to have baby in the bath, too, with these ingredients?